By Dan Ambrose: In what’s sure to be the best fight on the card, WBA super bantamweight champion Guillermo Rigondeaux (11-0, 8 KO’s) battles #3 WBA Poonsawat Kratingdaenggym (48-2, 33 KO’s) on Saturday night in a fight on HBO on the undercard of the Nonito Donaire vs. Jorge Arce fight at the Toyota Center, in Houston, Texas, USA. This is surely going to be a much better fight than the Donaire-Arce fight because that’s more like a mismatch between a top level fighter and an undersized fighter on the slide. The Rigondeaux- Poonsawat is the much better fight because Poonsawat isn’t undersized and he doesn’t’ have all the wear and tear on him that Arce has. Rigondeaux has been really impressing since beating World Boxing Association 122 pound champion Rico Ramos by a 6th round knockout earlier this year to pick up the strap. Rigondeaux has twice defended the title, beating Teon Kennedy and the huge 5’8” Robert Marroquin. 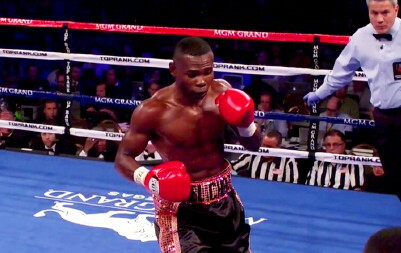 The fight against Marroquin wasn’t that easy for Rigondeaux because he was hurt a few times by the much bigger fighter. Marroquin had a four inch height advantage over Rigondeaux and he looked like he out-weighed him by 15 pounds in the ring. Rigondeaux looked a shorter and a lot lighter than Marroquin in that fight, so you can kind of give Rigondeaux a break for getting hurt against this hulking guy. The 32-year-old Poonsawat is plenty tough in terms of offensive skills. He’s going to really test Rigondeaux, because this guy isn’t someone that Rigondeaux will be able to crush like he’s done against a lot of the inexperienced and less skilled fighters than him since he turned pro. Poonsawat, a former WBA World super bantamweight champion, hasn’t lost since he was beaten by Ryol Li Lee in a close 12 round decision loss in 2010.